Y’know, I hadn’t actually sampled that much tuna poke salad in my life until recently. But I am a sucker for sushi, and an arrangement other than regular canned tuna salad sounded great. 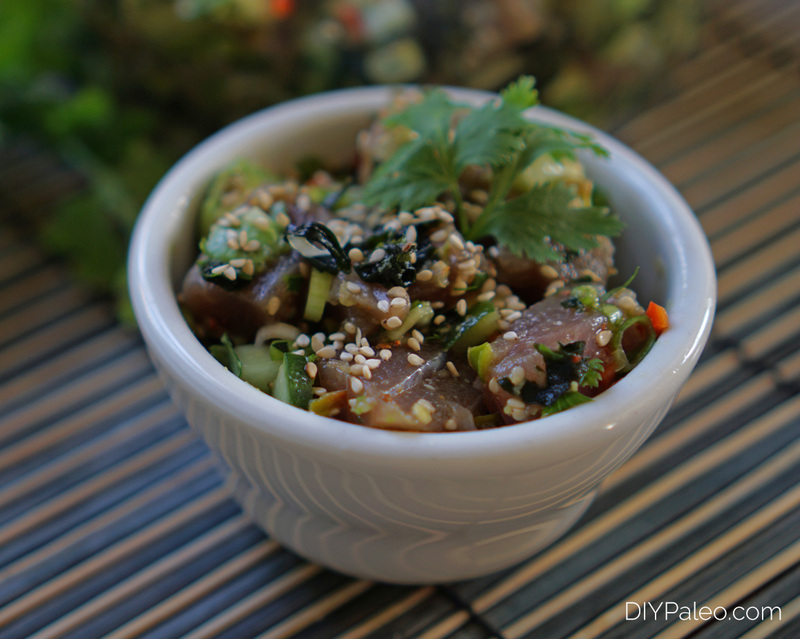 I used a lot of ingredients in this tuna poke, but you could omit certain things if you want. The saucy ingredients (coconut aminos, garlic, etc) are essential. Cucumber, avocado, and red pepper flakes, however, could be skipped. Yellowfin tuna was more affordable for this round of poke. Wild-caught ahi was $29.99 per pound at Whole Foods, which gave me a partial heart attack. I do think ahi would make a better salad, though. If you can find it for a reasonable price, get it! 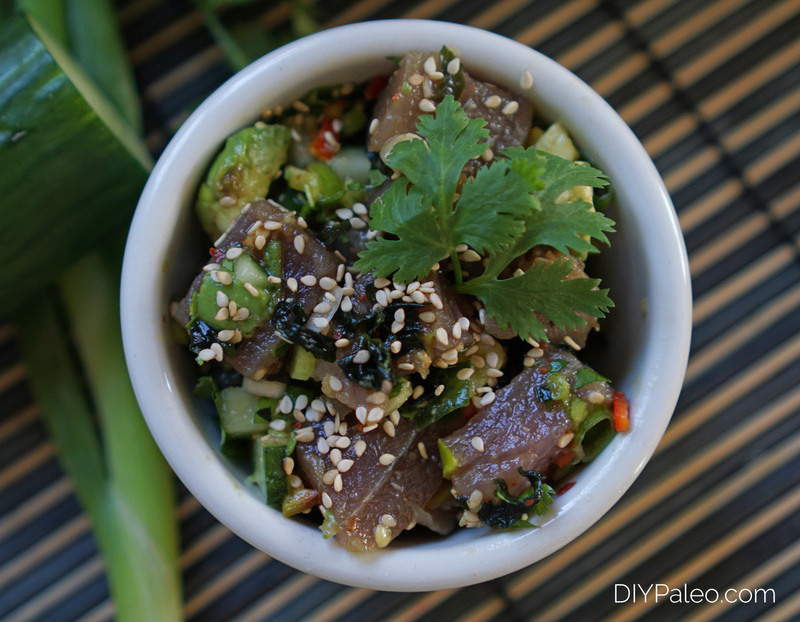 Tuna poke salad goes nicely with cauliflower rice and nori rolls. That’s how we ate it for dinner last week. If you can tolerate white rice, that could also be an option. On a different note, did you see that I’m now offering personal chef services? If you live in Denver and need help making more healthy meals, shoot me a message on the Personal Chef Services page. Cut raw tuna steaks into 1-in. thick cubes. Add tuna, cucumber, avocado, green onion, pepper and cilantro to a mixing bowl. Stir gently to combine. In a small bowl, mix garlic, ginger, sesame oil, coconut aminos, red pepper flakes, fish sauce and salt. Add to the large mixing bowl and stir to combine again. Mix in sesame seeds, seaweed flakes, and more salt if desired. Place in fridge and allow to marinate, covered, for 2 hours or more. Garnish with lime and enjoy within 2 days.